I always liked this one for a bit of an abstract reason. By naming in BIVA, I think most people will think of a beaver just because the name is close enough and not many other similar sounding words. They didn't hit us over the head with the gag and call it BEAVER towels. Kind of interesting how you'll see certain product types in multiples in a given series, or consecutive series. Like they found a previously untapped or underutilized product type and go to it more than once to take advantage. Two different hostess products and two different towel/tissue rolls in this series, cans of soda or beer in 7-8-9-10-11 after doing mostly bottles in earlier Series, more toy and game products in the later series, that sort of thing. You can find various little trends in product types if you look for them. I'm not looking forward to the series with the batch of magazine parodies. None of those will have matches to an exact issue's cover. It was all creative liberty. That may not be true in every case. Though I did not research all the magazines, I found that Umbrella from the 13th has a Vampirella counterpart with a very similar cover. That issue is from 1973 or 74, but remember that all the magazines from the later series were originally planned to be part of an all-magazine 11th series. While a bunch were subsequently pushed back into the 13th, 14th and 15th, all issued 1975, the associated parodies were likely created at least a year earlier. Conversely, I could not find a real-product counterpart matching Vague magazine from Old School 6, so I too wonder if some of the magazine parodies are completely imagined. I don't recall Dave ever posting the real product images from OS6 as he normally has on prior series; I'd be interested to see if Vague was a close match to the real product used. If you, or anyone else, want to find out more about the unmade Wacky Magazines series and see images of them, go to lostwackys.com and you'll find a whole section on them. I hope this helps you out. *Schnozmopolitan (Cosmopolitan, released in 1982 Album series, FB 1, and ANS7 (the last one as a foil sticker). Those are just the ones that I've seen on the website. Who knows how many other roughs for this unmade series may be out there, still undiscovered? I also think that any one of these would be perfect for future OLDS releases. What do you guys think? Kentucky Fried Fingers and Kentucky Fried Chicken. 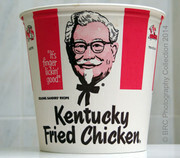 Not sure why they didn't thicken the red stripes to put the "It's Chicken Lickin' Good" gag inside. Maybe there is another container design out there with thinner red stripes? I couldn't find one. A really nice classic gag, but it bugs me that the chicken head illustration is not centered in the white space. I also think the fingers coming out of the top should have been breaded and not floating in the green steaming acid. I always liked this one as a kid - might have had something to do with being able to say "dam"
I also was living near Pittsburgh, and we had family in Beaver County, so I really got the main gag. Great gag, they nailed the packaging, and I still like it a lot. "Annoying" is the funniest part of the gag. I mean, how can anyone possibly be annoyed by a beaver? I mean, how can anyone possibly be annoyed by a beaver? Au contraire mon frere! Beavers can be quite annoying to some of us. Their dam building can wreak havoc to property. Squirrels are cute too - They do LOTS of damage though! Bumping this to catch people up. Thanks for putting the defibrillator to this thread. It's the one I look forward to seeing updates on the most. Now that I'm seeing the real product it occurs to me that I may have used this toothpaste quite a bit as a young lad. I remember the smiling mouths and I definitely remember using red gel toothpaste with a cinnamon flavor. I don't remember liking it much. More of a mint guy. Does it make much sense to randomly throw an ape on there and hope for some laughs? Probably not. Keep the mouths, change them to frowns or scowls, and put some crud on the teeth. Call it 'Close Down', as in shut those mouths off to that awful toothpaste. Great concept! I never liked Choke Up much, the gags feel forced and the art never grabbed me. Guess I missed this one when you first posted it. I've always liked this because of the main gag, and that fantastic chicken with a tie. I still call it by the Wacky name, and was disappointed when the company changed to "KFC." I never really got this one. Maybe if there was a picture of someone choking while brushing their teeth, and the taglines referenced that it's the toothpaste that that'll make you choke it would make more sense. I think by the 7th series (maybe sooner), they were starting to run out of 1st-rate concepts. Not to say there weren't some really great ones in the latter series, but producing 16 series in 4 years must've been a huge challenge. Also, Norm's ape is a good illustration IMO. Is that juvenile gorilla really smoking a cigarette, or is that Photoshopped? I can't tell. Also, does the genus Cannabis actually have any native species in Africa? If so, I've never seen, or heard of, gorillas smoking it in real life. That's got to be a gag. I like your observations on the fingers!! I didn't know about flipping the bird back then, and never thought of it as an adult. STD and STP. Today if they were to do the STD parody, it would be about Sexually Transmitted Diseases. Good gag, some good taglines, but I don't get "Makes Racers Edgy." The certainly nailed the can. I don't get "Makes Racers Edgy." Though not on the package, STP had a slogan during this time "The Racer's Edge" (meaning, advantage). As a kid growing up in Virginia, I listened to all the NASCAR races on the radio. I remember a commercial from the '70s for STP that had lyrics "Petty's his name, racing's his game, STP, it's the racer's edge," but I can't seem to find that anywhere on the Internet. Thanks! Now it makes sense. I remember a commercial from the '70s for STP that had lyrics "Petty's his name, racing's his game, STP, it's the racer's edge," but I can't seem to find that anywhere on the Internet. I think Gulp and Smell were the only two other gas-oil products. Oops. Forgot about that one.